Phantom, referred to by his song's title as Phantom of the Bwahpera, and also known by the anagram Tom Phan, is the end boss of Spooky Trails in Mario + Rabbids Kingdom Battle. 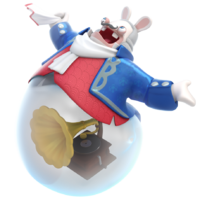 He is a levitating, heavyset Rabbid ghost with an Enlightenment-style attire and a Boo-like underside that occasionally turns transparent, revealing a phonograph inside. His name is also a pun on the Phantom of the Opera. He tends to be quite boastful about what he is, calling himself a "national treasure," as proven by his battle quotes. He also has a tendency to talk in sing-song. He is created when Spawny combines a Rabbid, a Boo Balloon, and a phonograph. His voice is provided by Augustin Chemelle. As per his name and theme, he sings a song for Mario and company before engaging in battle. The song is heard as part of the game's second trailer. He is the only Rabbid in game to communicate using normal sentences, instead of various grunts and screams. However, his song starts with several uses of the "Bwaah" sound, but with a deeper voice. He also makes these sounds throughout the battle itself. In battle, the Phantom is initially immune to all attacks. To be able to damage him, Mario and co. must destroy the light fixtures beside him, disabling the spotlights focused on him; the Phantom becomes vulnerable once all active light fixtures are smashed. Each phase of the battle has one more light fixture to smash than the last, as well as giving the boss new Rabbid minions at the end of his first turn; Valkyries, Bucklers, and Peek-a-Boos. His main attack is a powerful operatic scream that acts like a Rocket weapon; it hits everyone within a radius for 40 HP and can inflict the Push effect. He can also activate a ghostly shield around him; the first hero to move within range becomes petrified, unable to take further action for their turn. Upon his defeat, the Phantom will throw a melodramatic, sobbing tantrum. ↑ Augustin Chemelle on his Opera Music's profile page (August 3, 2017). ↑ Ubisoft (August 1, 2017). Mario + Rabbids Kingdom Battle - The Phantom of the Bwahpera Trailer. YouTube. Retrieved August 2, 2017. ↑ Ubisoft US (August 1, 2017). Mario + Rabbids Kingdom Battle: Combat | Gameplay Trailer | Ubisoft [NA]. YouTube. Retrieved August 2, 2017. This page was last edited on March 26, 2019, at 14:29.